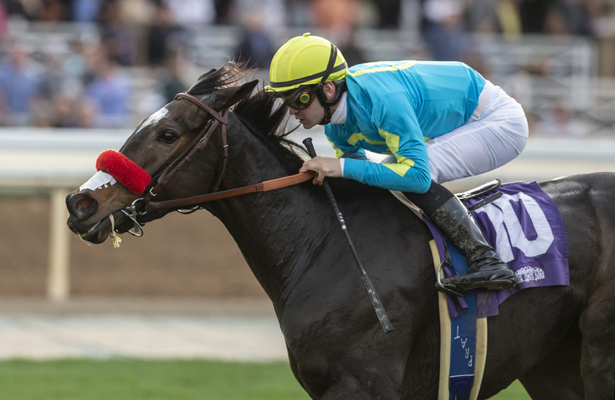 At 6-1 on the morning line, Pantsonfire didn’t know it, but she was the recipient of a cascade of late money, which made her the actual 2-1 favorite in Sunday’s Grade 3, $100,000 Astra Stakes, a marathon turf event at Santa Anita Park that she rallied late in to win by 5 ¼ lengths under Flavien Prat. Trained by Richard Baltas, the 5-year-old Irish-bred mare got a mile and one half over a “good” Santa Anita turf in 2:27.83. Fifth, about nine lengths off the lead as the field crossed the finish line the first time, Pantsonfire and Prat were content to maintain their position up the backside as frontrunners India Mantuana and Plein Air ensured a good pace. Heading into the far turn, Pantsonfire was on the move and a much closer fifth as she rallied four deep turning for home in what turned out to be an easy victory. Fourth in her most recent start, a minor stakes on synthetic Tapeta at Golden Gate Fields Dec. 8, Pantsonfire, who was also winless in her last seven starts, was off as the 2-1 favorite in a field of nine older fillies and mares and paid $6.20, $3.40 and $3.00. Owned by Next Wave Racing, Pat Maciariello, Jeremy Peskoff and Mark Silverstein, Pantsonfire notched her first stakes win and got her fourth win from eight Santa Anita stars while improving her overall mark to 20-4-2-4. With the winner’s share of $60,000, she increased her earnings to $218,936. Ridden by Mike Smith, K P Pergoliscious sat third for most of the trip in behind the dueling leaders and had to settle for second money, finishing a half length in front of Lynne’s Legacy. Most recently second here in the Grade I American Oaks on Dec. 29, she was off as third choice in the betting and paid $4.00 and $3.40. Ridden by Alonso Quinonez, Lynn’s Legacy was off at 11-1 to and paid $5.00 to show while finishing a half length in front of Plein Air. Fractions on the race were 23.85, 47.02, 1:11.49, 1:37.03 and 2:03 flat. There is special Martin Luther King Day Holiday racing tomorrow at Santa Anita, with first post time for a 10-race card at 12 noon.